Iron Tight Safe Rooms and Storm Shelters use only top quality, high security Medeco Maxum deadbolts, which allow our Safe Rooms to also be used as Gun Safes or Vaults for valuables and/or important documents. Medeco Maxum deadbolts are made of stainless steel with a solid brass, free turning collar and 1/4" mounting bolts that resist wrenching, prying, and hammering attacks. Follow this link for more information about Medeco Maxum locks. We have designed gun racks especially for Iron Tight Safe Rooms. We offer a Left Hand Corner Rack and a Right Hand Corner Rack that each hold 12 Long Rifles and 12 Pistols along with a shelf for storing accessories. We also offer a Single Rack that holds 6 Long Rifles and 6 Pistols and includes a shelf. 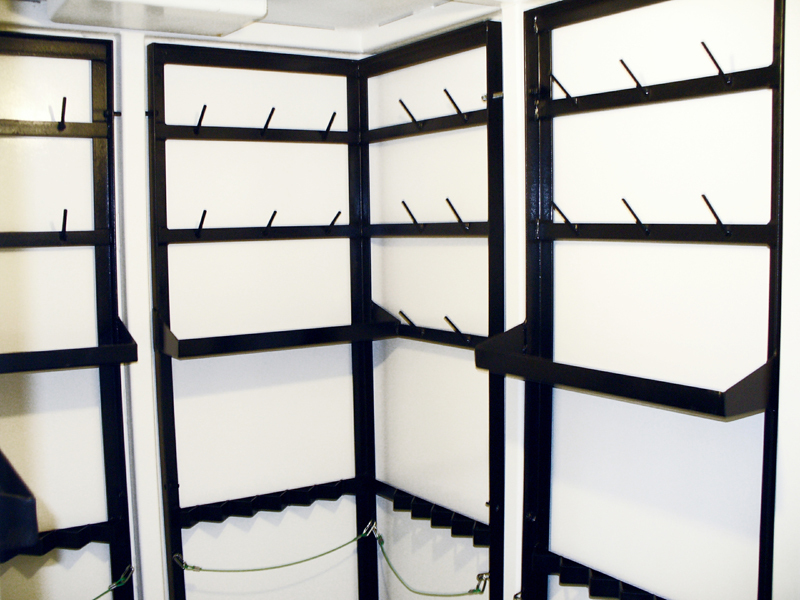 These racks are optional accessories to our Safe Rooms to make it YOUR MULTI-PURPOSE STORM SHELTER! We understand how important moisture control is when storing guns and valuables. Iron Tight is a proud distributor of GoldenRodGunsaver dehumidifiers. GoldenRod Dehumidifiers are the best product on the market and they come with a lifetime warranty. All of Iron Tight’s specially designed gun racks also include a holding rack for the GoldenRod. For more information about GoldenRod Dehumidifiers click here. For more detailed information on the sizing of our gun safes, click here.